If you haven't checked out the Pushmo series on the 3DS yet, I'd definitely give it a look as it's one of the best puzzle games I've played on it in quite some time. Soon after Crashmo was released to continue the block pushing and pulling fun, but there's one glaring issue with both of those games: they're only on the 3DS. What if you want to enjoy these games on the big screen? Well worry no more as Nintendo has your answer...sort of. While you can't play Pushmo and Crashmo on a console, a new entry in the series titled Pushmo World will be making its way onto the Wii U on June 19th. Aside from the typical puzzle solving, Pushmo World also includes a hub-like area called the Pushmo World Fair where you can create new puzzles and share them with players around the world. To celebrate the upcoming launch of Pushmo World ($9.99), Pushmo and Crashmo will both be on sale through June 13th in the 3DS eShop for 33% off. I'd definitely recommend giving at least one of the two games a look. REDMOND, Wash.--(BUSINESS WIRE)-- For the first time, a game in the critically acclaimed Pushmo series is coming to a home console. On June 19, Pushmo World will launch exclusively in the Nintendo eShop on Wii U at a price of $9.99. Like Nintendo 3DS games Pushmo and Crashmo before it, Pushmo World finds players pushing, pulling and climbing blocks to solve a collection of more than 250 new puzzles. What separates Pushmo World from the other games in the series, besides the crisp and colorful HD graphics and original puzzles, is the addition of World Pushmo Fair, an in-game hub that gives players an easy way to share and download new puzzles. To celebrate the upcoming launch of Pushmo World, Nintendo is holding a special price promotion event in which Pushmo and Crashmo will be available at discounted prices starting May 28 and running through June 13 in the Nintendo eShop on Nintendo 3DS. Players of all ages will easily fall in love with Pushmo World. The cute, playful characters like Mallo and Papa Blox will appeal to kids, while the satisfying puzzle-based game play will be a treat for longtime gamers looking for a challenge. In the game, players are tasked with solving three-dimensional block-based puzzles by moving blocks to climb to the top of structures. As the game progresses, the puzzles get larger and more complex, with some massive, screen-filling creations resembling familiar objects, animals and even classic Nintendo characters. 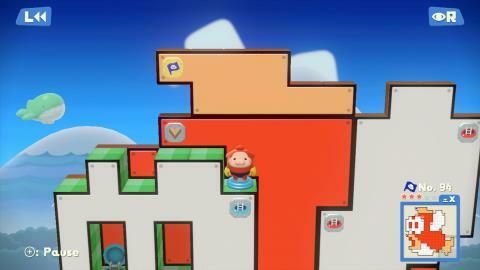 Pushmo World introduces a collection of training levels that players can use to hone their puzzle-climbing skills. The game also features a time-rewind option that lets players undo mistakes. This forgiving feature rewards players for being smart thinkers, rather than forcing them to restart a complex puzzle for making a hasty move. Being stumped won? ?t stop the fun: If players are stuck on a particularly tough puzzle, they can skip ahead to the next one. World Pushmo Fair is the main hub of Pushmo World and serves as an interface to the Pushmo World Miiverse community. Players will even find new puzzles created by the game? ?s developers in World Pushmo Fair. If players find a puzzle they love, they can leave feedback and even give it a friendly ??Yeah!?? in Miiverse via World Pushmo Fair. With an intuitive interface, World Pushmo Fair is an easy way for all players to find and share a near-endless amount of fun puzzles.
? ?Pushmo and Crashmo are two of the most well-received games ever released exclusively in the Nintendo eShop on Nintendo 3DS,?? said Scott Moffitt, Nintendo of America? ?s executive vice president of Sales & Marketing. ? ?Pushmo World makes it easy for players to create and share their own puzzles, and it? ?s a joy to experience Mallo? ?s colorful world in HD for the first time.?? From May 28 at 9 a.m. PT through June 13 at 8:59 a.m. PT, Pushmo and Crashmo are available at up to 33 percent off in the Nintendo eShop on Nintendo 3DS. Pushmo is available at a price of $4.69 and Crashmo is available at a price of $5.99. Visit www.nintendo.com/eshop/offers for more information. For more information about Pushmo World, visit www.pushmoworld.nintendo.com. About Nintendo: The worldwide pioneer in the creation of interactive entertainment, Nintendo Co., Ltd., of Kyoto, Japan, manufactures and markets hardware and software for its Wii U?? and Wii?? home consoles, and Nintendo 3DS?? and Nintendo DS?? families of portable systems. Since 1983, when it launched the Nintendo Entertainment System? ?, Nintendo has sold more than 4.2 billion video games and more than 670 million hardware units globally, including the current-generation Wii U, Nintendo 3DS and Nintendo 3DS XL, as well as the Game Boy? ?, Game Boy Advance, Nintendo DS, Nintendo DSi?? and Nintendo DSi XL? ?, Super NES? ?, Nintendo 64? ?, Nintendo GameCube?? and Wii systems. It has also created industry icons that have become well-known, household names such as Mario? ?, Donkey Kong? ?, Metroid? ?, Zelda?? and Pokémon??. A wholly owned subsidiary, Nintendo of America Inc., based in Redmond, Wash., serves as headquarters for Nintendo? ?s operations in the Western Hemisphere. For more information about Nintendo, please visit the company? ?s website at http://www.nintendo.com.